﻿﻿ As early childhood educators, it is important to continually be the facilitators for all children, and educate according to “Developmentally Appropriate Practices” that motivate all children to become life long learners. The purpose of early childhood education is to encourage all children to reach their highest potential and provide guidance that facilitates each child’s ability to function successfully in society. It is important to help the parents, families, and staff to work as a team and meet educational needs of all children. Classroom management and discipline go hand-in-hand. We strongly believe that children need freedom within their environment, but freedom within limits. Freedom and discipline are similar. In order to be free, a child needs to look at being independent. True freedom of choice leads to thinking and reasoning intelligently and a strong self esteem and competence which is the ability and capability to do what is needed. A teacher’s role is to guide children toward a stronger feeling of self. A teacher is always looking for work and play that leads to order, harmony, and self-development and eventually to discipline within a child. This is only accomplished by helping each child take pride in themselves. The teacher is the guardian of the environment and the link between it and the children. The teacher encourages feelings of empathy and mutual respect among all individuals within the environment. A teacher must lay the groundwork for discipline and guidance. 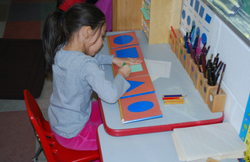 The Montessori Pre-School environment is a “prepared” learning environment. It is an area for a growing child to do things for himself or herself – without the immediate help of adults. “The Prepared Environment” is a place where the children can be increasingly active, and the teacher increasingly passive. It is a place where a child can direct his own skills and become conscious of his/her self. Our goal as CMS is to assist all children to reach independence, order, harmony and self-discipline through his/her own efforts.